Thanks to Dr. Ankur Sangoi, El Camino Hospital and Stanford University, California, for contributing this case. To contribute a Case of the Week, follow the guidelines on our Case of the Week page. (1) We are thinking about adding two features - let us know what you think. First is a cell phone application. What would be the most important app for you? Case of the Week, CD Markers, something else? Second, for particular topics, we are thinking of adding side by side images of the topic and other common entities in the differential diagnosis. We would try to highlight the distinguishing features. Call (248/646-0325) or email us (NatPernick@hotmail.com) with your thoughts. (2) We posted a new article on our Management Page, Revenue as a By-Product of Investment: 6 Factors to Consider When Researching Billing Companies, by Diana R. Brooks, PSA (click here). This page is also accessible from the Home Page under Clinical Pathology Chapters. (3) Support PathologyOutlines.com by doing your holiday shopping at Amazon.com. Click here, or on any Amazon banner on the left side of our Home Page to visit Amazon.com. By visiting Amazon via these links, they will send us 4-5% of the cost of all items you purchase (out of their profits), at no additional cost to you. A 54 year old man had a large posterior nasal septal polypoid mass protruding through his right nares, which was excised. Seromucinous hamartoma is a rare tumor resembling microglandular adenosis of the breast. 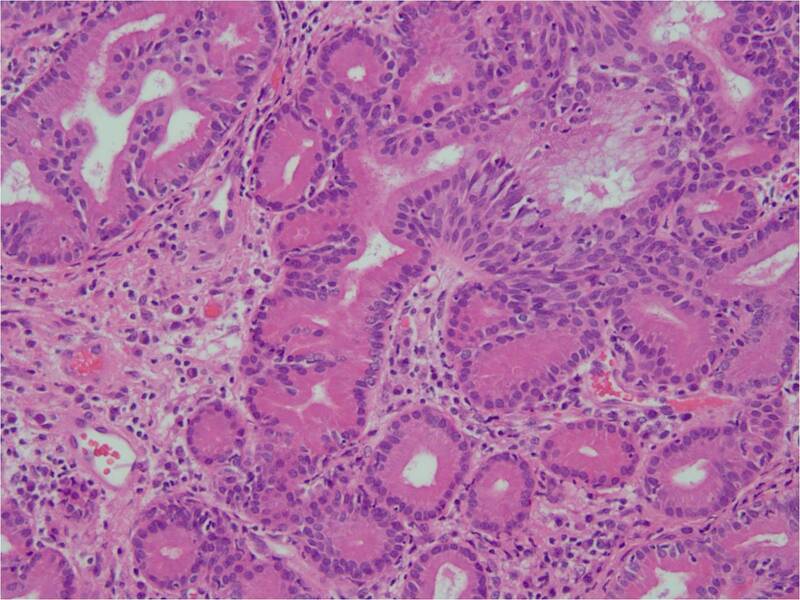 The tumor is composed of a slightly disordered pattern of small serous tubules, ducts and glands with eosinophilic cytoplasm. There is no prominent mucinous component. The stroma is cellular with variable fibrosis and edema. The tubules are lined by one layer of cuboidal cells, without a myoepithelial or basal cell layer. There is no prominent mitotic activity or necrosis. 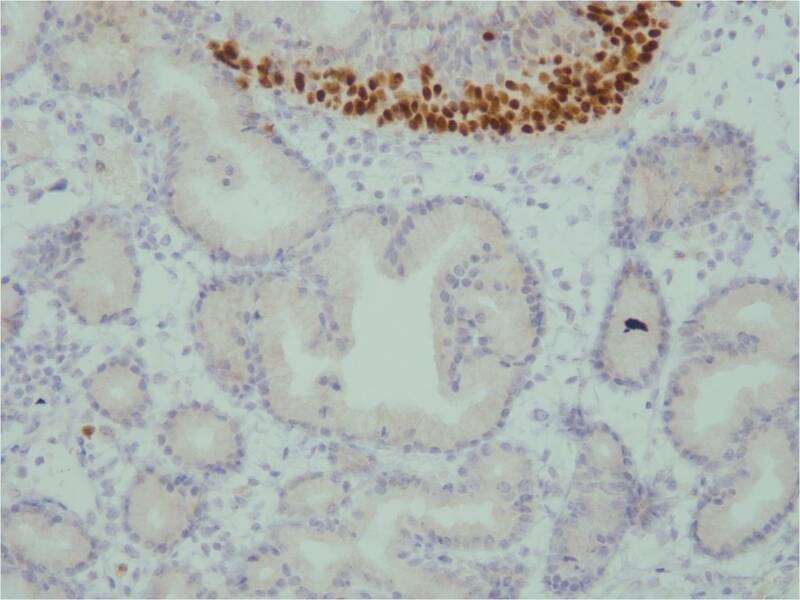 The glandular cells are usually positive for CK7, CK19, S100, EMA and lysosyme. 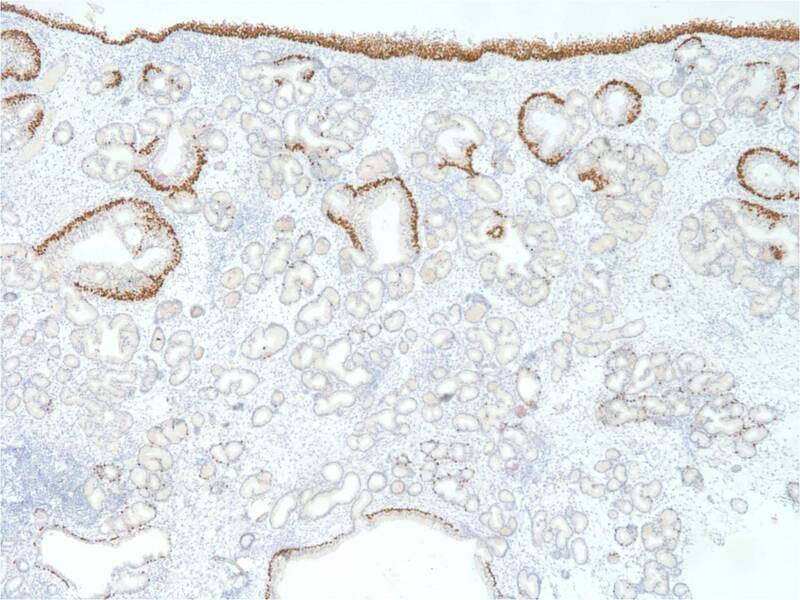 There is usually no or only focal p63 staining, due to the lack of myoepithelial cells (Virchows Arch 2010 Oct 5 [Epub ahead of print], Histopathology 2009;54:205.). The differential diagnosis includes inflammatory nasal polyp, respiratory epithelial adenomatoid hamartoma and low grade sinonasal adenocarcinoma (Head Neck Pathol 2010;4:77). 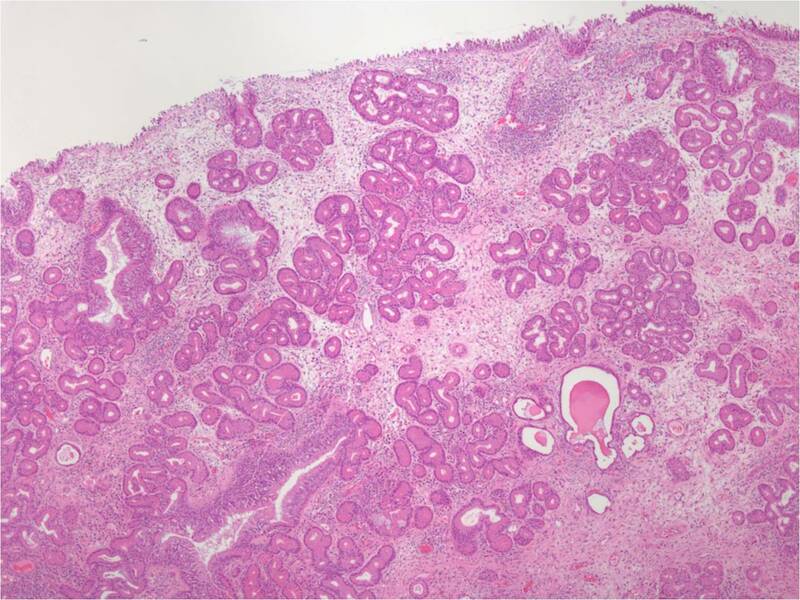 Inflammatory nasal polyp is composed of edematous lamina propria with a variable inflammatory infiltrate including eosinophils. 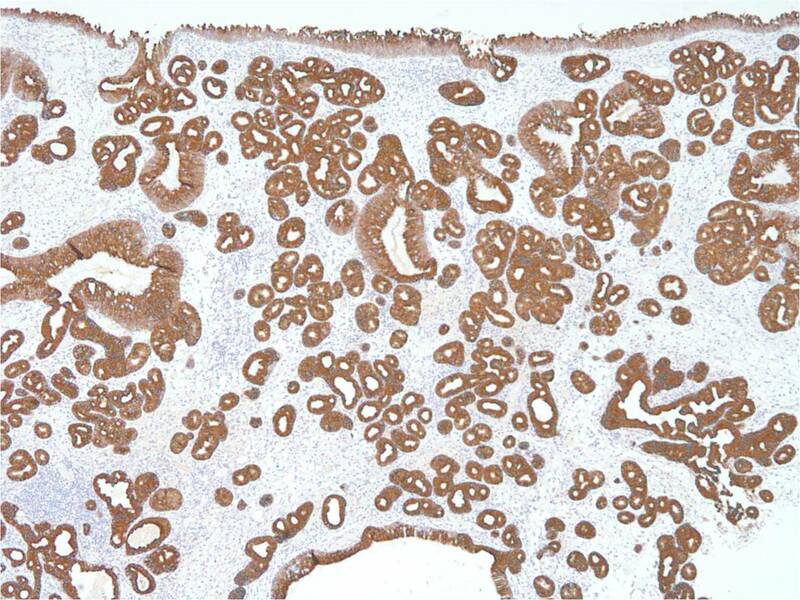 Respiratory epithelial adenomatoid hamartoma (REAH) is composed of submucosal glands lined by respiratory epithelium, with periglandular hyalinization, and a variable connection to the surface. REAH may form a continuum with seromucinous hamartoma, as many cases have features of both entities. 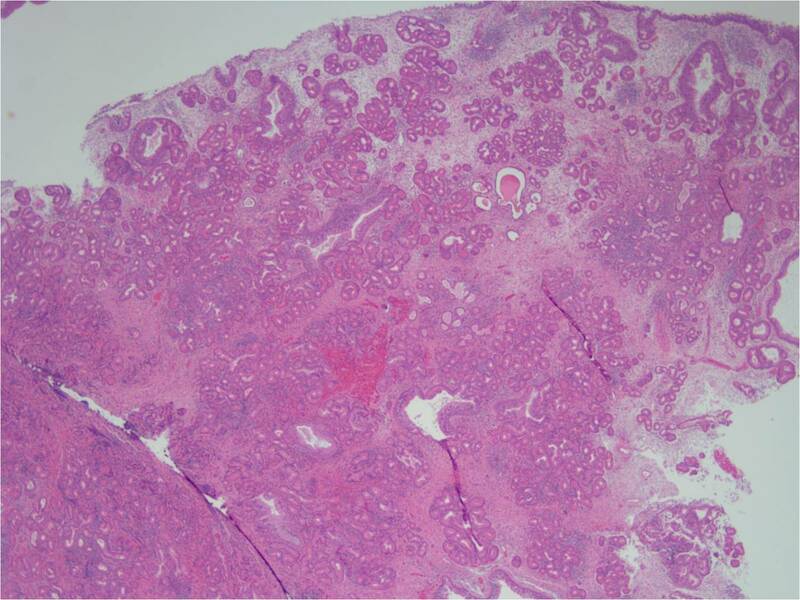 Low grade sinonasal adenocarcinoma is a diverse group of bland tubular or papillary tumors which have a potential to recur, and an uncertain potential for metastasis. 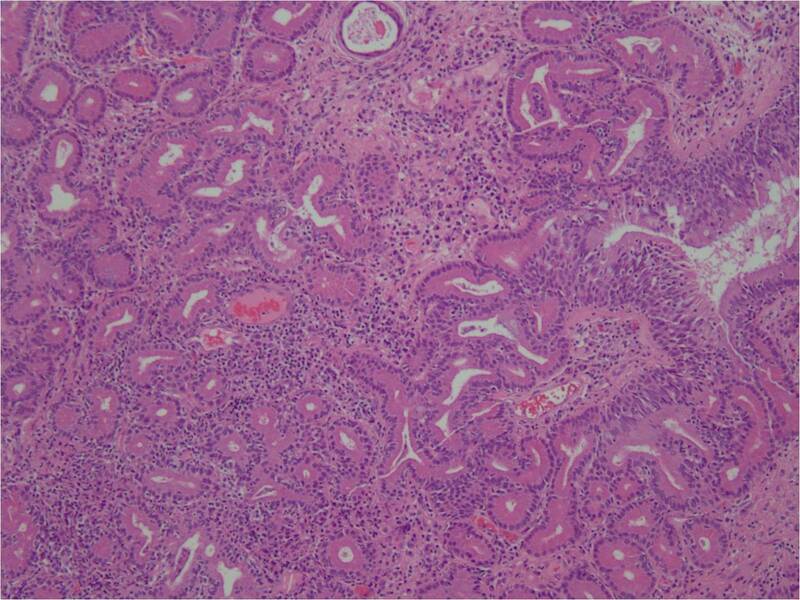 These adenocarcinomas are divided into salivary and non-salivary types. The salivary types (adenoid cystic carcinoma, basal cell adenocarcinoma and epithelial-myoepithelial carcinoma) have a well defined myoepithelial component. 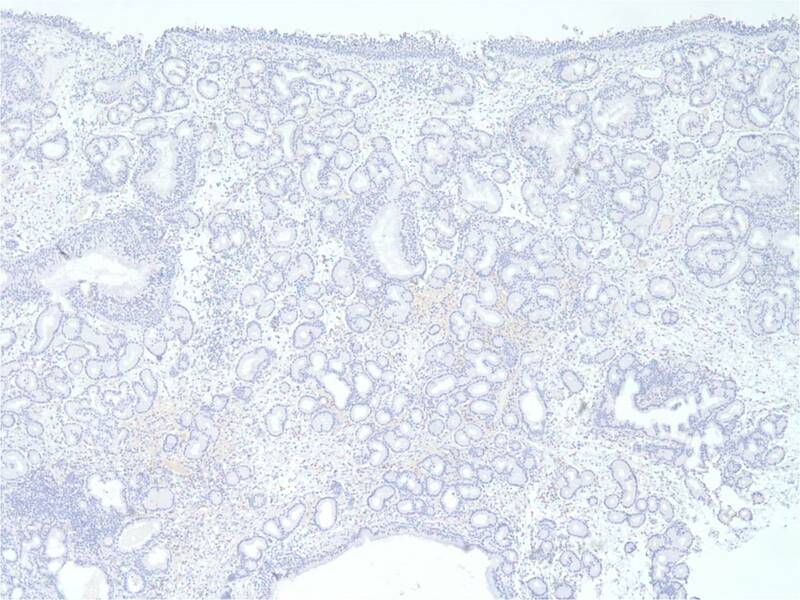 The low grade non-salivary types are either intestinal (resemble intestinal epithelium, CK20+, CDX2+) or non-intestinal (back to back glands that are infiltrative). Excision of a seromucinous hamartoma is usually curative, although these tumors may recur locally.